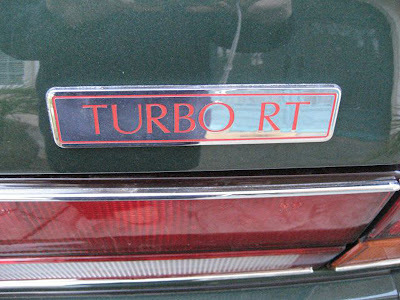 Currently on sale on ebay item number 190093638543 is one of 50 Bentley Turbo RT motor cars. It's Grease Lightening - You're the one that I want - Ouh ouh ouh! 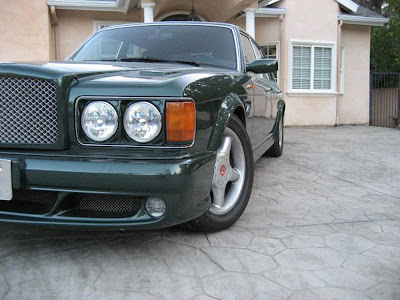 Yes, this Bentley Turbo RT is the exact car that I want in the exact colour I want, British Racing Green. 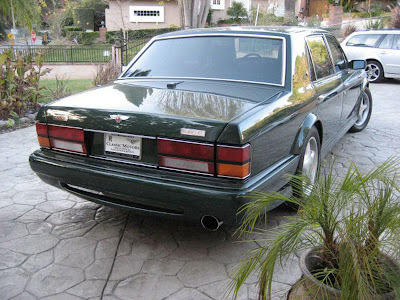 It even has the Mulliner enhancements that I want. Everything, except that the steering wheels in on the wrong hand oh, I mean left hand side. 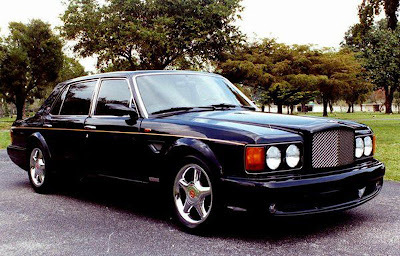 This car is uber cool and simply better in all respects than any other Bentleys or Rolls Royce of this body shape made over the 17 years that they were in production. It is in the detail. Let me explain. Have a look at the bumper. It is more rounded, has fog lights and bright mesh inserts. It has three under bumper sections where the main grill flows down to the under bumper inserts, just like the 2007 Azure. Now look at the wheel arches. It is a wide body with very large protruded arches which blend seamlessly with the rounded front bumper. The side profile. The front fender vents totally look the business as explained in a previous article on side vents. 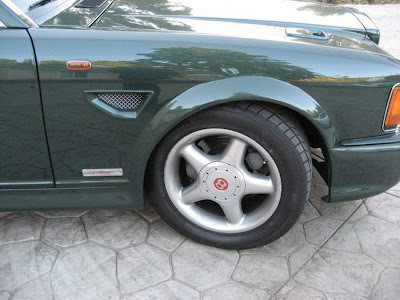 The side skirts are very much in proportion, and the side mirrors are most modern. The 18" wheels are not too large, and have very fat rubber. The bonnet has heat vents, how cool it that! The rear bumper apron is rounded as well, and the car sits low, but not low as in ridiculous that the wheels scrape, but just right. The rear bumper also has mesh inserts, and the exhaust. Well its 3" stainless steel, perfect for pumping the gasses out to kill hippies. BRG leather works very well and the red piping is a great finish. But what is that between the seats? My gosh! 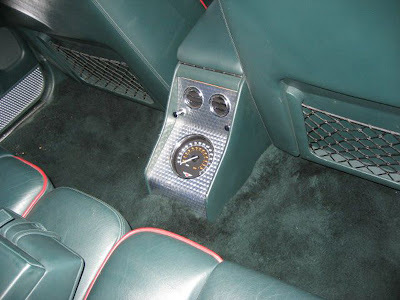 Yes its is a rear mounted large speedo with the classic organ draw bar air vents. The brushed aluminium lower door panel is a perfect compliment to the speedo surround. The brushed aluminium continues for the whole dash, as well as the centre console. It has a big red button in the centre of the console above the compulsory Breitling clock. You guessed it - the red button is the start button! I have not even mentioned the engine. It has 420hp. 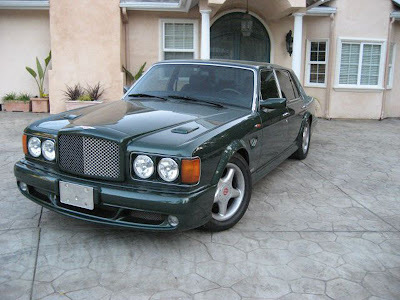 The most powerful Bentley Turbo R/ Mulsanne equivalent made. The obvious problem I am going to face when wanting to purchase this car is availability. Only 50 were made in 1997 and 1998. That is world-wide. I live in Australia and have more of a problem, simply due to the numbers of Rolls Royce and Bentley cars sold those years. From my previous article on sales figures in Australia, only 11 cars in 1997 and 15 cars in 1998 were sold in Australia - and that includes every different model of both Rolls Royce and Bentley. 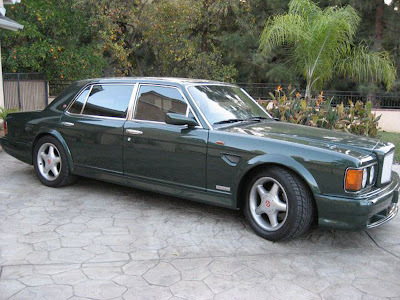 The Bentley Continental R and T, as well as the Bentley Azure were all competitors to the Turbo RT, and would have made up the majority of the Bentley sales for these two years - not to mention that Rolls Royce was more popular in 1999 than Bentley sales wise. I have another issue. 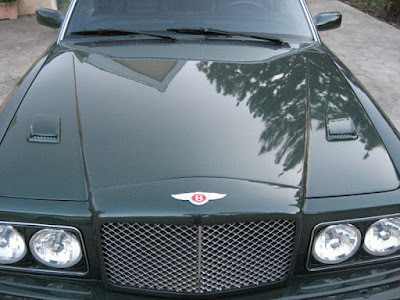 I really want the Mulliner side vents and the bonnet heat vents. From all the Turbo RT's that I have seen pictures of from around the world, less than half have these options. Damn. 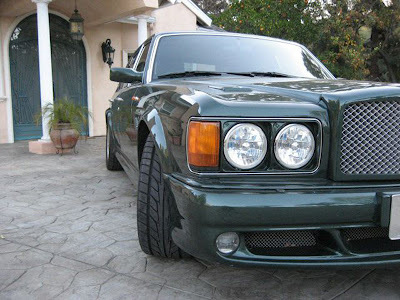 But some do, like this Masons Black Bentley Turbo RT for sale at Vantage Motorworks. I would take a black one as well. Again I have found another black Turbo RT with Mulliner vents for sale previously, and this time right hand drive - perfect! 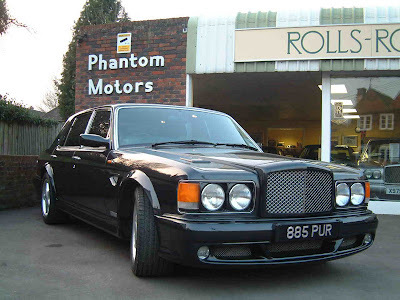 Was sold previously by Phantom Motor Cars. 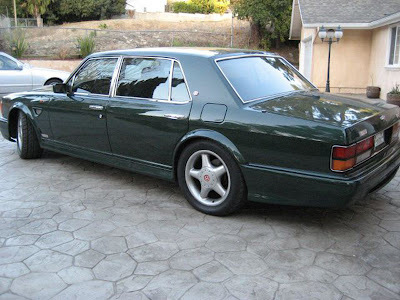 I am still dreaming - tossing up the idea of purchasing a cheap 1981 Rolls Royce Silver Spirit Asian import, calling up Mulliner and obtaining new front and rear bumpers, round Bentley headlights, new mesh grill, new wheels and of course the vents! This would mean not taking on Ferraris at the lights of course. I am sure this idea will be frowned upon! 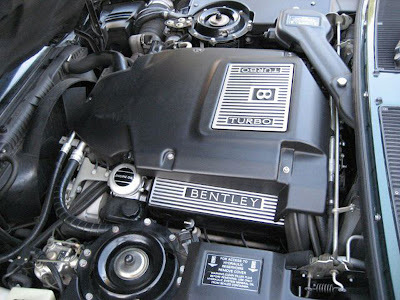 The cars you have tracked down are not Turbo RTs with Mulliner enhancements. Each of those cars are Turbo RT Mulliners. They only produced 11 in RHD and about 7 more in LHD. 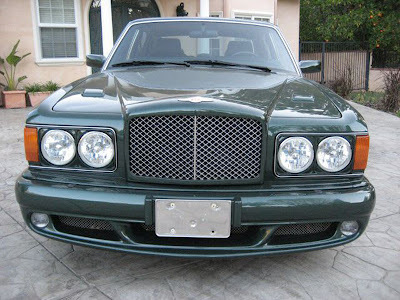 The original owner gave a new RT to Mulliner and paid about 60K to have the whole car modified. Many RTs have vents etc added but the original Mulliner models go far further than body changes, even the rear track is different. 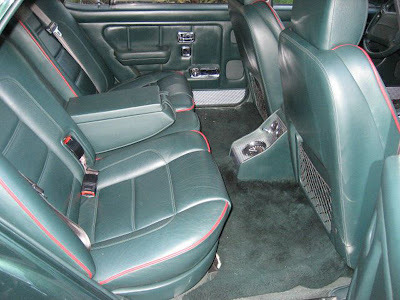 On top of that because so few were made and each could be specified as the owner wished in terms of dash, seat leather patterns and a few extras, you will never find an identical car. I have been looking for one for ages as like you I think they are the pinacle of the evolution of the last true BENTLEY. A true collectors car and will be worth a fortune (although very expensive now) in the future. WELL I HAVE JUST SOLD A BENTLEY RT ON EBAY,AND MY OH MY HAVE I DROPPED A BEAUTIFULL CAR FOR NO MONEY,DID NOT REALISE IT WAS SUCH A BEAST!,AND I CANNOT REPLACE IT FOR LESS THAN 25K MINIMUM!! 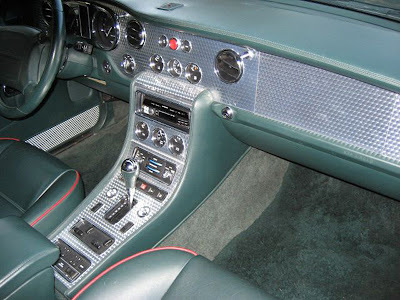 I say old boy, I am not so certain Mulliner would part so easily with the parts that you so desire, to build up your ruddy Asian import, or perhaps I am underestimatimg their jolly generosity.